If you asked the average comic reader "what is the best known indie comic book? 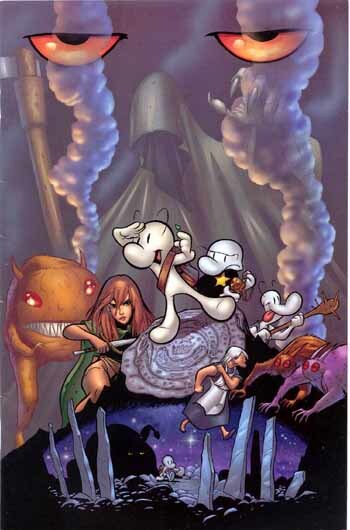 ", about 60% of the answers would be "Jeff Smith's BONE". 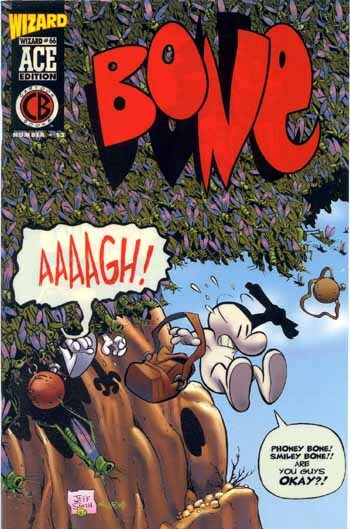 The fact that BONE #1 was the first small press comic that was reprinted in WIZARD MAGAZINE's famous WIZARD ACE VARIANT COVERS series says pretty much everything. In the wild and wacky era of the early 90's, Jeff Smith managed not only to make a name for himself in the industry, but also to become a rather hot property. In the exclusive interview that follows, the creator of the most outrageous funny animal related adventure series (I couldn't come up with something better) makes a meaningful and extremely interesting recap of his career so far! 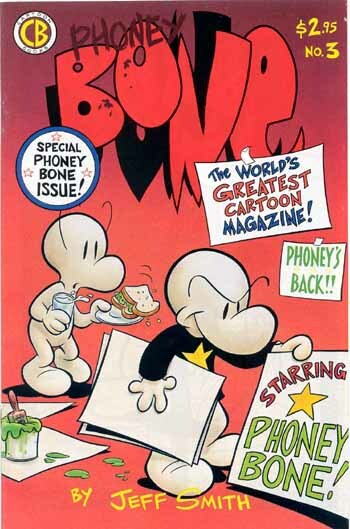 Comicdom: Let's go way back, at the beginning of BONE and Cartoon Books. What was the chain of events that made it all true? Jeff Smith: In college I wanted to try out a daily comic strip called THORN. In my mind, it would be a mix of European fantasy comics like METAL HURLANT (HEAVY METAL magazine), and US comic strips like POGO and DOONESBURY. I had been drawing the Bone cousins, Fone Bone, Phoney Bone and Smiley Bone since childhood, but this was my first attempt to use these characters publicly or to try and express my thoughts with them. Later, I changed the name of the feature to BONE and started the comic book. CD: Why BONE? What was your first reason for doing this kind of story? Was your initial intention to make a "funny animal" story and all the "fantasy-dragon-lord-of-the-rings" stuff came later, or did you have the whole thing planned to the end? JS: THORN, the college strip, was not planned out, I just came up with the characters and started drawing. I think it lacked something. THORN was more of a "funny animal" story. The adventures were meant to be humorous but not connected. There were elements of fantasy in THORN, like dragons and monsters, but they were just props for the Bones to work against. However, by the time I started the comic book BONE, I began to envision a long, multi-layered story with a beginning, middle and end. I knew this new work would need more depth and structure. I outlined the major plot points and wrote down the ending before I ever drew a single panel in the BONE comic book. CD: It is obvious to someone, as he progresses through the story, that you are greatly influenced by classic fantasy works, namely LORD OF THE RINGS. Are you a fantasy fan? If yes, at what level? Any favorite books, novels, writers and comics? Finally what is your opinion on how fantasy is represented in the comics medium today? JS: I like grand tales of far away places. Stories that hint of mysteries hidden just below the surface. Legends, myths and fables all count as fantasy to me. My three favorites are Malory's LE MORTE D' ARTHUR, STAR WARS, and LORD OF THE RINGS. I am not very taken with run-of-the-mill Sword and Sorcery or Dungeons and Dragon bits. As you can see, only one of the above even has elves and dwarves. As far as comics go, SANDMAN was an excellent fantasy, but as a rule, European comics have a much better sampling than the US. CD: On a related note, I've heard many times people say: "I used to love BONE, until the time all this fantasy stuff got going". What's your reaction to this? Do you feel that you might have alienated some people who were just looking for a humor book? JS: Of course there are people who will never like fantasy as a genre, but I can't help them. I mean, if you don't like the story, stop reading it. But if the story is good, then what difference does it make if it's a western, or a romance or a humor book? CD: Cartoon Books-Image-Cartoon Books again. 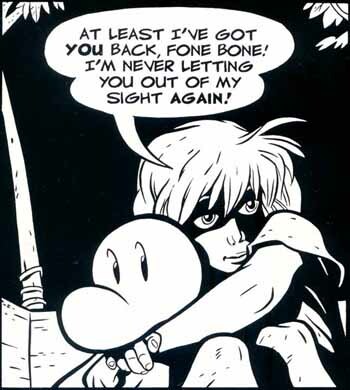 I think the Image period of BONE was just 4 or 5 issues... What went wrong? JS: It was a temporary solution. My arrangement with them was pretty friendly. I still published BONE myself and sent it to the distributors, and Image collected the money for me. 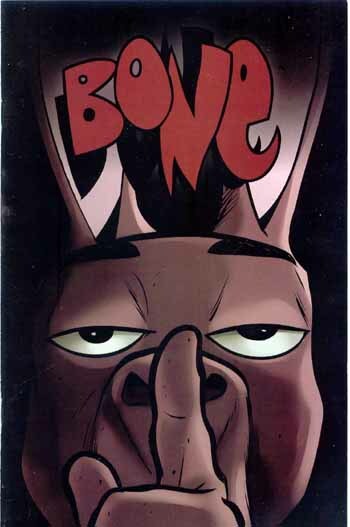 Still, knowing it would be temporary, I left the BONE book collections under my own Cartoon Books label. JS: In the vein of Sim? I don't think so. It would never even occur to me to fill pages and pages of my comic with didactic prose. CD: Have you ever had any big mainstream offers? And if so, why did you turn them down? JS: I have had both mainstream and alternative publishers express interest in publishing BONE, but complete control is important to me. Not creative control on BONE, obviously I could have worked that into any deal. What I needed was control over the book's publishing schedule. How long to write and draw any given issue, and more importantly, how long to keep back issues and graphic novels in print. 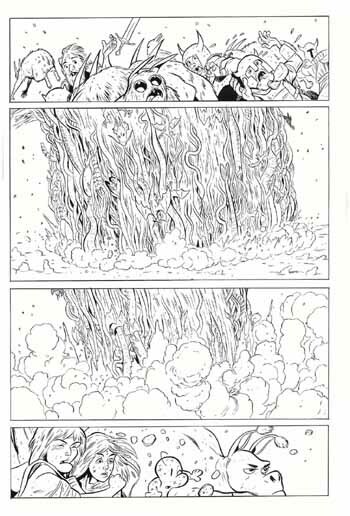 Since BONE is a single story spread out over 55 issues and collected in nine paperbacks, keeping the entire story in print and available was crucial if I wanted the ending to work. The only mainstream character offer that intrigued me was when DC offered me Captain Marvel. CD: What's your artistic background? Have you ever had any formal studies in art or were you self-taught? CD: What are your personal indie comics favorites? JS: I have many. Of the current US crop, Dave Cooper, Alex Robinson, and Craig Thompson. I also enjoy anything by Lewis Trondheim and Bryan Talbot. 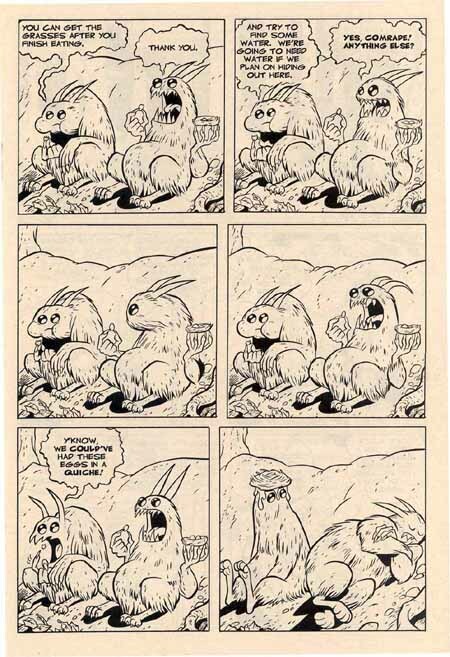 My two favorite indie creators of all time: Jim Woodring and Paul Pope. CD: So, BONE is now over. What's next for Jeff Smith? Do you plan to return to the characters in the near future or do you want to start something completely new? JS: My next indie project will be very different from BONE. It will have only humans in it and has an eclectic mix of drama, fantasy and science. A romance about the speed of light. It could be ready in 2007. Before then I will be working on the Captain Marvel miniseries for DC called SHAZAM: MONSTER SOCIETY OF EVIL. It's four issues, each one in the 48 pg. prestige format. The chance to do a golden age adventure serial complete with cliff-hangers and talking tigers sounded like fun to me. I have no sequel planned for BONE, but I can't rule out ever drawing the cousins again. CD: Thank you very much for giving us the chance to talk with you and good luck in all your future projects. 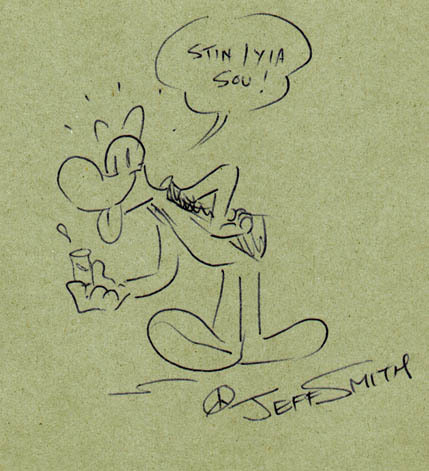 "Cheers" from Jeff Smith to all his Greek Fans!